This amazing roast beef recipe is from my sister-in-law, L., and I have made it at least a dozen times since tasting it at her house. It is ridiculously easy and has flavor that explodes on your tongue. Cover the roast half-way with water in a slow cooker. Add in the onion soup and Au Jus mix. Cook for 4 hours on high, shred, and cook for two more hours in the sauce. My favorite way to fix this is into sandwiches. Cut hardy dinner rolls in half, sprinkle with pepperjack or mozzarella cheese and broil until the bread is crispy and the cheese is all melty, about 3 minues. 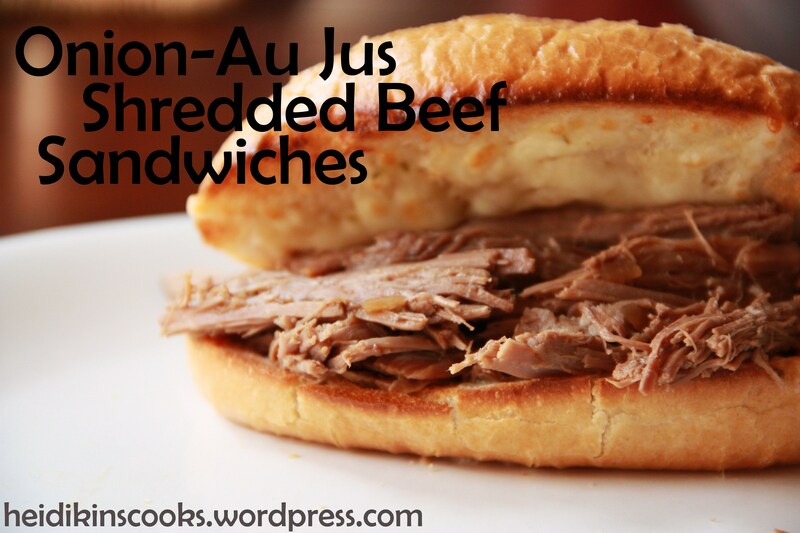 Cover in shredded beef and enjoy. Sounds yummy!! Bookmarking for later!